I had the opportunity to attend a Z event in my hometown the other day, and while listening to the presentation and discussion by the various Nikon reps and fooling around with the cameras and lenses (I have done this several times) and the new 14-30 f/4.0 lens (first time) I reflected on how good a job that Nikon has done. I thought that I would take this opportunity to thank Nikon by acknowledging certain of their achievements that are important to me. First, I would like to thank Nikon for not threatening the value of my current Nikon gear by creating not only an adapter (FTZ), but an integrator - they should have called it the FTZ integrator, not the FTZ adapter. I was fretting before the launch of the Z that Nikon would create a situation where my f-mount lenses would not seamlessly integrate with a Z camera. With a quibble regarding my 135mm f/2.0D and 200mm f/4.0D lenses, the integration is seamless. But hey, the 200 is a macro lens, so I rarely used auto-focus. In fact, the 200 will be superor on the Z, as the focus peaking benefits in my view far outweigh the loss of auto-focus. In fact, focus peaking will bring new life to my seven manual focus lenses, especially my PC lens. So another thank you for focus peaking. I am heavily invested in Nikon gear with over 25 f-mount lenses (22 that I shoot and are not in retirement), three DSLRs, a Coolpix A, almost all the accessories that could fit on a D800/D850 including grips, 5 SB-910s. So this was quite important to me. Second, I would like to thank Nikon for not correlating the maximum aperture of a lens to quality. On the f-mount, a smaller aperture usually (though not always) meant a lens with inferior optics and build quality. This is apparent with all four lenses in the Z-line, but it really hit home with the 14-30 f/4.0. This lens is almost certainly the best wide zoom money can currently buy. I base this on the images that were demonstrated to me the other night (tack sharp wide open, edge to edge, if not quite corner to corner), the MTF charts that Nikon has published, the fact that it takes 82mm filters, the fact that when holding the 14-30 in one hand and the 24-70 in the other, I had to look at the lens to tell which one was which - they are both really light. Now I can truly decide if I want a big or a small lens without having to think to hard about image quality. When I do buy a Z eventually, the 14-30 will be in my kit. I use these focal length's usually for land and city scapes, so I don't need 2.8. In fact, I expect their 1.2/2.8 lenses not to be significantly better than their 1.8/4.0 lenses. This will not be a slight on the 1.2/2.8 lenses, as the 1.8/4.0 lenses are already very sharp. Third, I would like to thank Nikon for giving me focus points across the frame, as I often like to shoot portraits at 1.4 when the eyes where beyond the focus points of my D850. This is nearly impossible if you can't hold focus on an eye. In fact, I would also like to thank Nikon for improving edge sharpness so that when taking shots that I just described above, the most important part of the image is sharp. But this is not a Z benefit. The 105 1.4E, 28 1.4E (with a quibble at the extreme edges) and the 24-70 2.8E also provided this benefit. Fourth, I would like to thank Nikon for designing a mount that is capable of delivering lenses with great image quality. The four new Z-lenses demonstrate what Nikon has achieved here. This is not strictly a Z benefit. First with the 58 1.4G (Note), it has been apparent that Nikon has doubled down with image quality. Today, my 105 1.4E and 28 1.4E continue to astound me. Note: The 58 deserves criticism for being somewhat soft wide open - anyone that says it is mush however is probably a gearhead and not a serious photographer - there are other qualities to this lens that demonstrate that Nikon made a big effort in achieving an image quality objective. Five, I would like to thank Nikon for going all in on XQD, including making it future compatible with CFast. Buffer concerns will, if not quite yet on the Z6 and Z7, soon be a thing of the past. Now, just give me my 200mm f/2.0E and 28mm f/3.5E PC!!!! Grrr......then I will have everything I can possibly want in F and can start investing in Z.
WestEndPhoto: Time to get a “second “ body! Its a perfect fit for the center console of your car! When i have to travel light, the Z, 24-70, and a telephoto with an FTZ is the (almost) prefect kit, lacking only the soon to arrive 14-30! Nikon also got SnapBridge sorted out, which for me eliminates the need for a second card in the body. Backup JPEGs go to my phone in my pocket, a much better place for them than a card. I can edit them and fire them off to my clients right away. They can get back to me right away and request different photo compositions or other changes. I had one very happy client yesterday because he could direct me from 2000 miles away yesterday. Yes, even with my D850 and a 24-70 2.8E already in it, I think I could fit a Z7 and 14-30 4.0S as well. A large centre console is very useful. Yes for all the complaining about certain issues with the Z series I think it's important to look at all they did right. It's not perfect but I think it is about as good as one could reasonably expect for a first effort. If you predicted a year ago that Nikon would release a camera like the Z6 with great IBIS and very competent video AF I think most folks would have said that was crazy talk. Well said WestEndPhoto. I feared that Nikon was loosing their way somewhat in recent years with some concern over quality control and disappointment that the Sigma Art lenses for example were in some respects superior to equivalent Nikkors. I also was not sure what the point of the small 1 Series, J and V cameras was. Of course the DSLRs were still great but it looked like the company was resting on its laurels.We now have ample evidence in the Z6/Z7 and the fabulous new lenses, together with backwards F mount compatability via the adapter that Nikon have exceeded even the best expectations. Well done indeed. WEF that must be a substantial center console. The console in my truck might hold a Z body w/o lens, but little more. Yes, when I was shopping for a four wheel Sherpa for my gear, this was a huge consideration. I ended up buying a Toyota Sequoia Limited. I did not buy the Platinum edition because it has a centre console in the 2nd row which sacrifices a seat - and with two child seats, I need three seats in the second row. I have fit both my D800 and D850, both with grips and 1.4 prime lenses, into the console simultaneously. I was originally thinking a 4 Runner, but the console for me and the eight seat for my wife made the Sequoia a no brainer. It also fits eight adults simultaneously which means I can bring 5 models, a hair and makeup artist, photography assistant and all of their gear on a shoot. I have a Thule roof mounted and a Thule hitch mounted compartment for when the gear gets serious. PS: I learned to drive on a 1983 Toyota Landcruiser with a snorkel and front and back winches when I was 14. It was my dad's first Toyota after three Landrovers. I happen to know that that Landcruiser is still being driven by my dad's friend on a daily basis with almost a million km on it - I think it is heavily refurbished and has even survived me rolling it when I was sixteen. So when I buy cars, reliability is the first consideration and Toyota is number one in this regard. I would only consider a non-Toyota if I wanted something badly that I could not get in a Toyota. My second car is a Camry which sadly will not even fit one D850 with a small prime in the console. So those of you who have followed my posts closely will appreciate that I also think this way about camera gear and for any that think I am "odd", perhaps this sheds some light on that. Recall that my first Nikon was a rifle scope for my 7mm Remington Magnum when I was 8. And if you buy a Nikon rifle scope today and drive over it with your truck, Nikon will give you a new one. Actually Mhedges, I should have talked about the IBIS, as that would have been impossible on a DSLR except when operating in LiveView. Olympus had IBIS in their upper level 4/3s DSLR's (not to be confused for M4/3s mirrorless cameras) over 10 years ago, and it did not require liveview to work. It was only 2 way, but the technology was much newer then. IBIS has been proven to be very good for short focal lengths, but not so hot for longer telephoto glass. I suspect we'll still see Nikon put VR in telephoto glass once they get around to it for the Z mount. It’s true that IBIS has been done on DSLR but I think it’s far from optimal. It can’t stabilize the viewfinder which could be an issue framing certain shots, and I personally can’t figure out how you get full sensor movement without messing up the AF system. Not sure how the Olympus system worked, I know users of the cameras raved about it, because they could have both IBIS and IS working together for maximum stability. Never used it myself, and the lack of stability in the viewfinder was said to be a little off putting, but didn't seem to affect image quality. +1 on Toyota. We have two, both 2015s, Highlander and Tacoma. I''m posting this because this is a photography gear forum after all, and my main gear purchase last year was The Truck. Had various trucks through my adult life, starting with my dad's International Harvester pickup. That thing was a beast, and it set my truck expectations rather high. 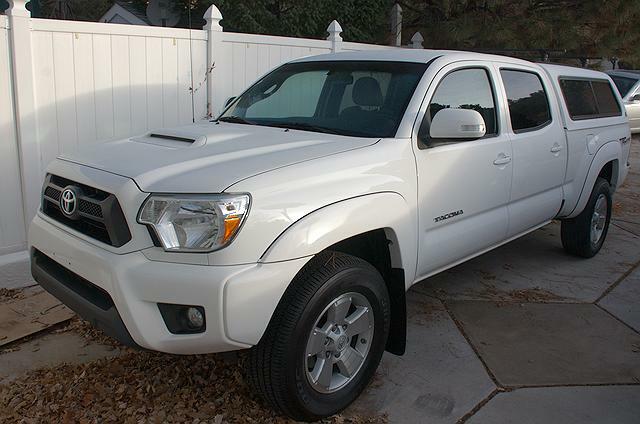 The 2015 Tacoma pretty well meets that expectation. Big console compartment ( ), long bed for camping, double cab lets me carry either passengers or camera equipment, six-figure miles expectation with respect to reliability, and that was the last model year before they started making them "comfy", with all the car crap like heated seats. Heated seats???? Nice camera bag. Billingham, Think Tank and Toyota are my favorites. The other thing I would mention in the "Things they got right" list would be the apparent firmware upgrades to improve performance. It seems like Nikon has taken a lot of its users concerns into concideration with the Z system. Oh, and here's my Toyota. It's a 92 that's need totaled 3 times. I only drive vintage cars. I'm good with Toyotas, my wife drives a Camry and my fun car is a Subarota BRZ, but , my truck's an F150. One of the most inpressive things, WEF is an 8 year old shooting a 7mag. For my previous trucks, my wife had this lament: "For your next one, could it be all one color? Preferrably, not primer?" Capt_spaulding, the recoil was a lot for an 8 year old so my dad put a heavy stock on it until I was about 12. I couldn’t get three shots in the same hole at a hundred yards, so replacing the Bushell scope with a Nikon fixed that. I have been loyal to Nikon ever since. I couldn't agree with you more! This is what has gotten me so excited. Can't wait til the end of this month when I get to visit my local shop here cash in hand hahaha Nikon also as mentioned earlier did a good job not stepping on the toes of it's loyal customers by rendering the F mount obsolete as well.